Sometimes we all need a little lift—something to put the bounce back in our step. If you are like many, you may struggle with self-confidence. You may also compare your successes and failures with those of others. If everything is going well in your life, this tactic may temporarily bolster your sense of self-worth. But what happens when things aren't going so well? 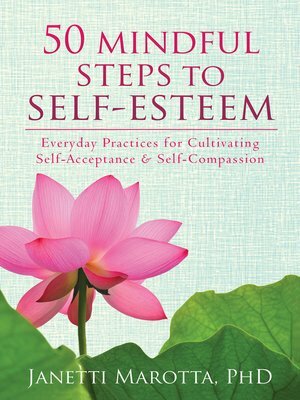 Based on the idea that true self-esteem is grounded in internal, rather than external factors, this book offers 50 easy-to-use mindfulness practices that will help you improve inner awareness and live a more fulfilled life without harsh self-judgment. Mindfulness can help you battle feelings of low self-worth by encouraging you to pay attention to your negative thoughts as they occur, accept them, and ultimately control of how you react to them. The exercises in this pocket-sized book are intended to be simple, brief, and powerful. These are practices to settle into each morning, perhaps before your cup of tea or coffee, and which can be sprinkled throughout the day when you are at work, play, or home. To help you keep track of your thoughts, the book also includes journaling exercises that will help you discover what actions may have led to feelings of positivity or negativity. By focusing on your own awareness and thought processes, you will begin to understand what factors cause you to feel bad about yourself, and honestly assess those factors without giving in to feelings of hopelessness. You will discover that true self-esteem has less to do with what the world is telling you, and has everything to do with what you tell yourself.